Zaire Kelly was shot and killed while on his way home from a college mentorship program in September. 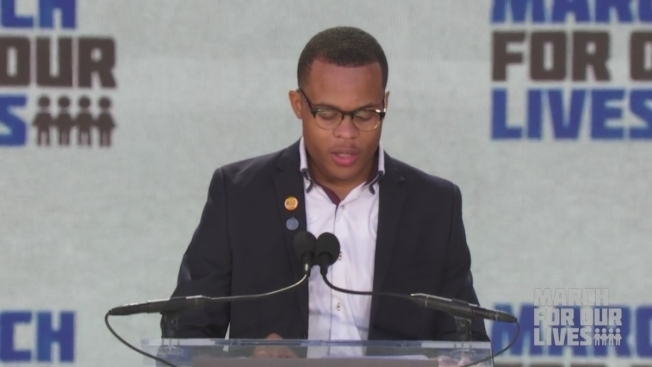 His brother, Zion Kelly, spoke at the March for Our Lives on Saturday. Kelly called on D.C. to expand safe zones near schools. In an emotional speech delivered before thousands of March for Our Lives protesters, student Zion Kelly remembered his brother, Zaire Kelly, who was shot and killed in Northeast D.C. last fall, and demanded D.C. expand public safety zones near schools. “He was a person. A leader. An inspirer. Not just another statistic,” Zion said about his brother, who was attacked and killed in September while walking home in Northeast D.C. from an after-school college mentorship program, News4 reported. Zaire was 16 years old. Zion Kelly asked the D.C. Council to expand public safety zones to include any person in a public or private day care, elementary school, vocational school, secondary school, college, junior college or university. “This means that every student in Washington D.C. would carry the protection of my brother’s name, ensuring safety as they travel to and from school in our city,” he said. The city should also put up more signs declaring gun-free zones, Zion said on a News4 Today appearance Sunday. "Can you imagine how it would be to lose someone that close to you?" asked Zion. "Sadly, too many of my friends and peers can." Police data shows that 48 people have been killed with guns in D.C. since Zaire's death. At least five students and teens have died in 2018 from shootings, News4 reported. The current law allows D.C. police to declare emergency zones near public and charter schools and in limited areas where students walk to access public transportation. In those public safety zones, police can tell groups of three or more people to disperse if they have a reasonable belief that the group intends to commit a dangerous or violent crime or an assault. The Zaire Kelly Public Safety Zones Amendment Act of 2018 is not listed in the D.C. council’s legislative database, but the D.C. Council Twitter page noted his request. Zion Kelly joined two other D.C.-area students and more students from around the country who called on government leaders to take specific actions on gun violence, including banning bump stocks and AR-15s at Saturday’s rally, which drew an estimated 500,000 people to Washington, D.C.
“Just like all of you, I’ve had enough,” he said. He told News4 that he went on stage for his brother. Kelly said the March for Our Lives was the second time he'd spoken publicly, but the public can expect to hear from him again. "It's just the beginning," he said.